I'm happy to announce that one of my favorite shops, Soranoiro, has opened a 3rd outlet. This one is inside the Tokyo Ramen Street, a collection of eight shops within Tokyo's newly remodeled Tokyo Station. I don't think I even need to talk about this one, the above picture of their Special Edo-Style Chukasoba is enough. As is this one of their vegan ramen. The menu here is reflective of their main shop, with just enough switched up to make it a different beast. The chukasoba has thinner noodles, thin strips of menma, and a delectable chunk of kakuni stewed pork. The price is a bit high at 1100 yen, but you really get a lot of value for that 特製. Tokusei means special. Soon they will have an Okinawan style shio ramen and a vegan tantanmen. This shop space used to be for Shichisai. And while I am sad to see them go, Soranoiro is a worthy successor. Nice design. Tokyo Station is a crazy place, with millions of people using it daily. It's nice to be able to relax for a few minutes and enjoy a slurp. Yes, I am biased. Anyone with a Soranoiro sticker on their phone must be a fan. Just above Den. Tokyo Ramen Street is always changing. Some of the shops, like Rokurinsha, will never leave. Open early to late, all year. T's Tantan is an offshoot of Jiyugaoka-based T's Restaurant. Their claim to fame? Healthy vegan cuisine. While I haven't been to the original restaurant, they are quite famous and based on their reputation should be able to pull off a tasty meal. Can they do it? Can they make delicious eats at a ramen-only restaurant? Nope! The tantanmen was flavorless, apart from a strange aftertaste. Just look at the above image. Does it look appetizing? The spicy tantanmen isn't much better. The addition of sliced spring onion and hot chilies doesn't do much. The shoyu ramen includes a sprinkling of mystery meat. Probably soy-based daizu. 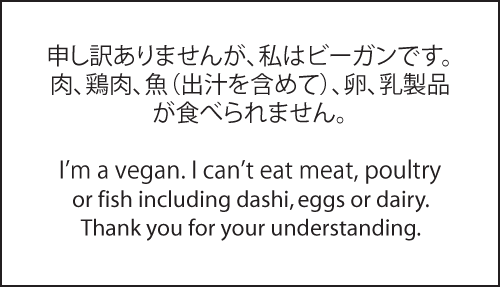 Vegetarians, especially vegans, have a near impossible time in Tokyo. In a city that could be considered the culinary epicenter of the world, most chefs have no idea about the rules of dietary restrictions. Simple explaining that you can't eat meat, and you will probably get some fish and maybe a bit of chicken. Explain that fish is also taboo, and you may find a sprinkling of dried shrimp substituted for flavor. I speak from experience with that one. I can't introduce you to good vegan cuisine at T's. The least I can do is link to some nice printable cards that may or may not help you out. Courtesy of Just Hungry. Vegetarians are not completely in the dark when it comes to ramen. Please do yourself a favor and head over to Soranoiro for a bowl of their Vegan Ramen. It's an awesome bowl that meat eaters would be happy with. You can even get a green smoothie at Soranoiro while you wait for your noodles to cook. The vegan I was with was very happy with that combo. Summer is upon us, and that means all your favorite shops are doing limited chilled ramen dishes. Called hiyashi in Japanese, you can expect some interesting creations. Chefs really let loose in the hot summer months. Check out a couple of last years offerings here. Thanks for shouting out my book, Kikanbo! This year, Kikanbo is doing a spicy avocado bowl. Two of my favorite things! Wow. You have a cold, creamy soup topped with half an avocado, guacamole spread, nuts, and a drizzle of hot and numbing oils and spices. The avocado kills almost any spice at first, but be careful. A minute or so after slurping and I was feeling the heat. For a limited time in the summer of 2015. Finding great ramen on Tokyo's east side is akin to finding a diamond in the rough. This part of town can be dirty and confusing, and the presence to too many salarymen means the food can be rather generic. The short walk to Chiranai Sakura will take you through what appears to be Japan's diamond district. Just past all those overpriced rocks is the new Aki-Oka Gourmet Street, a collection of ramen shops built under the train tracks between Akihabara and Okachimachi stations. The shops are mostly famous shops that have sold out and become boring chains (TETSU, Nantsutei, Nakamoto), except for one. Chiranai Sakura comes out of Nagano, and features some colorful art on the walls. As well as an entire staff of females clad in colorful Japanese kimonos. 長野美人! The menu, though not extensive, offers a few tasty-looking choices. The top-billed bowl is a standard chukasoba. I was told by a ramen friend to get the 王様中華そば. Osama, fit for a king, brings together some local Nagano specialties to make a nice ご当地, local-style, bowl. The local, in the case of this bowl, comes in the form of rustic negi green onions and a healthy kick of ginger. If you can imagine, historically, the life of someone living in Shinshu, the old name for Japan's Nagano area, you probably think of hardened farmers tilling the land day in and day out. Well, negi and shoga are both considered stamina foods, and there is enough stamina in this one to keep you running all day. The negi are particularly good. Rough cut, they slowly melt into the soup as you slurp along. Any strong tastes dissolve into a sweetness that you only get from letting onions cook, naturally, into soup. Take that sweetness, along with the kick from the ginger, and you have local Shinshu ramen. This shop is part of the awesome Bond of Hearts Group, which helps produce some great shops in Nagano and beyond. Tonkotsu gyokai tsukemen isn't as dominating as it was a few years ago in the Tokyo ramen scene, but it is still the easiest thing to find. Any major station will have at least one highly ranked shop. Oborozuki, meaning hazy moon, is Meguro's answer to thick, flavorful soup. But I wasn't here for the thick stuff! No, I was on a hunt for good shio tsukemen. The popular Osaka-based ramen blogger at Philoramen turned me on to his favorite Tokyo shio tsukemen. I plan to hit them all, starting with his favorite. Shio means a light soup. But how can you make a salt soup stronger without making it overly salty? Therein lies the problem I have with shio tsukemen. You can make a porky, fishy soup as thick as you want, and it will usually hit the mark. What can you add to a something non-viscous? Seafood. This broth is full of octopus, scallops, and mussels. Along with an extra helping of negi onions and other greens, you get an intense seafood flavor without too much saltiness. It isn't not salty, though. This soup is almost impossible to drink by itself. Better stick to the slurping. Add in some pickled umeboshi, and squeeze on some lime. The shio is yellow on the ticket machine. If you want what the shop recommends, their noko tsukemen, thick and normal, go for the tried-and-true upper left button. Looking back at my (very) old postings on Ramen Adventures, I am both embarrassed by my writing and nostalgic about a time where I knew almost nothing about ramen. Idaten had a pop-up at the Tachikawa NY Ramen Square, and I went back in 2008. I went, I slurped, and I was surprised to learn that shoyu ramen can have a strong taste. Fast forward half a decade . . . They have been long gone from the Ramen Square, but the original shop in Shizuoka city is still popular. Though the shoyu is still what most regulars order, I really wanted to see what the Teppen was. Billed as ご当地ラー麺, local ramen, I didn't know what to expect. Shizuoka is famous for a few things, but how can green tea and oranges make it into a bowl of ramen? Oh, and Mt. Fuji. Very cute. Idaten make their own noodles, so it was easy to incorporate a little matcha powder into the mix. Though the soup was light, you really don't get a massive tea flavor, just a slightly different texture. And that chashu, well it was flavored with local mikan, a type of small Japanese orange. Interesting, for sure, though not something I will be getting again. Yes, this bowl is fun, but overshadowed by their regular menu. Shizuoka city is a fantastic place for food. I'm not sure why, but this smallish town has more specialty gourmet, local sushi, and stylish cafes than any other comparable city in Japan. Apart from the regular menu, Idaten has four limited bowls to reflect the seasons. I wish I was around here enough to sample them all.